Jaimi from Nick's season (quelle surprise) is dubbed the "wildcard" because she's bisexual so she could ask anyone on a date. 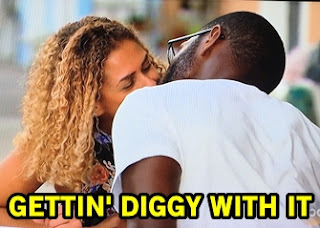 The speculation is much bigger than the actual result, as Jaimi asks Diggy out on her date to sip margaritas in town and discuss that she's attracted to people, not gender. Dominique is a little upset because her relationship with Diggy was starting to grow. Double trouble rolls into Paradise in the form of The Twins, Emily and Haley. They have their eyes on Derek and Dean and look forward to creating drama with their double date card. Since Derek is extremely taken, Haley decides to take out serial killer Jack Stone. Emily demands Dean come on the date but gets declined twice, asking out Tickle Monster as her backup. Jack Stone last minute decides he'd rather spend time with Christen than be a fallback for the twins. The twins get pissed, leave Paradise, and angrily throw scallops. All the happy couples have their check-in so we can recall that this is allegedly about finding love. Derek and Taylor are still steady and have the starting-to-feel-love discussion. Jack Stone thinks Christen is marriage material. Dean and D.Lo can openly explore their connection. Robby's feels for Amanda are as unwavering as his hair. Adam hopes to keep the momentum with Raven going. But Chris Harrison makes a daytime visit with a big announcement: this is the last day of Paradise. OH SNAP!